Gabrielle's Angel Foundation for Cancer Research hosted its signature fundraiser, the Angel Ball, on Tuesday, October 29th at Cipriani Wall Street. The black-tie benefit, hosted by Grammy-nominated song writer Denise Rich featured a cocktail reception, dinner, live musical performances, a paddle raise and both live and online auctions raising nearly $3 million for the Foundation’s research initiatives. This year’s gala honored three individuals for their outstanding philanthropic contributions to cancer research. Supermodel Karolina Kurkova presented Simon de Pury, Chairman, de Pury de Pury with an award for his dedication to raising much needed funds for cancer research. Hugh Jackman along with his wife Deborra-lee Furness honored Deborra-lee’s mother, Fay Duncan, President of the Fight Cancer Foundation in Australia and Ethan Zohn took the stage to talk about how research and the work of Clay B. Siegall, Ph.D., Co-Founder, President & CEO, Seattle Genetics, saved his life. The Angel Ball, which was emceed by Entertainment Tonight correspondent, Rocsi Diaz began with an incredible performance by ten-time Grammy Award-winning singer and songwriter Chaka Khan. 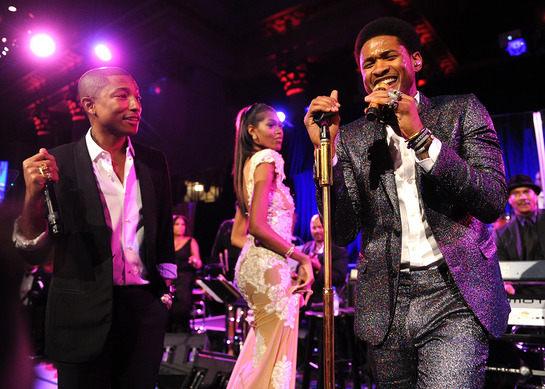 Later in the evening singer-songwriter, rapper, and record producer, Pharrell Williams took the stage with DJ Kiss to perform a medley of his hits – including “Blurred Lines,” and “Get Lucky.” Pharrell then surprised the crowd when he welcomed Usher to the microphone, to “light the stage on fire.” The two performed a full set which included “Yeah,” and other songs. For the sixth year in a row, Board Member and celebrity jeweler Lorraine Schwartz supported the event as Gala Angel Sponsor. Simon de Pury, Chairman of de Pury de Pury hosted the Live Auction featuring five luxury lots which raised $505,000. Star Jones led the evening’s paddle raise, which raised $343,900. The Foundation also partnered with charitybuzz.com for an online auction which runs through November 6th at www.charitybuzz.com. Dinner Chairs for the event included Hugh Jackman & Deborra-Lee Furness, Khaled AL Muhairy, and Marc E. Lippman, M.D. Michele Rella, Founding Board member and this year’s Gala Chair oversaw the event’s Co-Chair committee members, who included: Loreen Arbus, Hélène Benhamou, Caroline Berthet, Missy Bridges, Dori Cooperman, Bonnie Pfeifer Evans, Maria Theresa Fauci, Fran Glasenberg, Michele Herbert, Victoria Hunter, Pamela Johananoff, Candy Kern, Emel Kiral, Louise Kornfeld, Inga Kozel, Heather McDowell Levin, Allison Lutnick, Danielle Merollo, Annabella Murphy, Laura Nicklas, Camilla Olsson, Cynthia Ott, Donna Poyiadjis, Alisa Roever, Nancy C. Rogers, Beth Rosenthal, Inga Rubenstein, Charleen Sacks, Ofira Sandberg, Catherine P. Saxton, Lesley Schulhof, Felicia Taylor, Marcy Warren, Laura Stolman Watzky and Adriana Weiss.